St. Louis, MO. 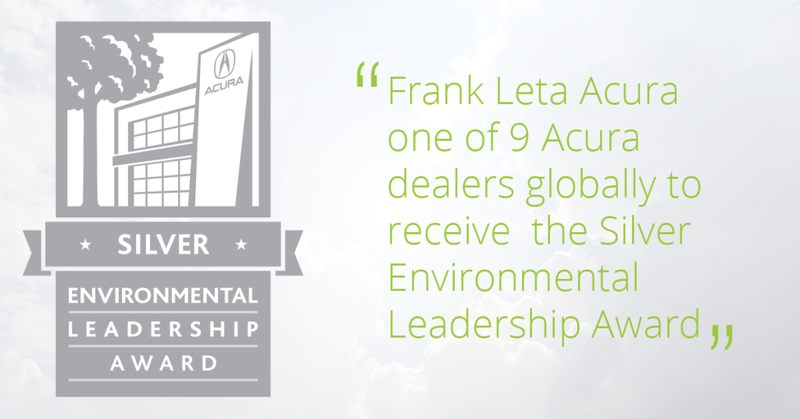 September 14, 2015 – Frank Leta Acura has earned the Acura Environmental Leadership Award and has been recognized by Acura as a leader in the company’s effort to reduce the environmental impact of dealerships in communities around the nation. Frank Leta Acura earned the award for achieving specific environmental targets based on a rigorous points system that includes reducing total energy use at the dealership by at least 10 percent. Frank Leta Acura has taken numerous steps to reduce its environmental impact and to earn the Acura Environmental Leadership Award, including installing solar panels, LED lighting both indoors and out, motion sensing light switches which conserve lighting in vacant rooms, advanced thermostats, and various other high efficiency solutions to conserve resources. Acura introduced its new voluntary “green dealer” program to its U.S. dealers in the fall of 2011. The company uses a third party evaluator to conduct environmental audits of participating dealers and recommend strategies for reducing their energy use. Over the past three decades, Acura’s parent company has been working to reduce the environmental impact of its products, manufacturing and logistics operations, and facilities in North America. These initiatives are reported annually in the company’s North American Environmental Report. Expanding its environmental initiatives to its dealer body is the logical next step in the company’s effort to reduce waste, energy use and CO2 emissions across the full spectrum of its operations and throughout the lifecycle of Acura products, including at the point of sale. Frank Leta Acura is a full service Acura dealership, providing its customers in the St. Louis metropolitan area with high-quality sales and service support since 1986. Frank Leta Acura continually supports a number of charities including the American Diabetes Association, The Breast Cancer Research Foundation, Children’s Miracle Network Hospitals of Greater St. Louis, Children’s Hospital St. Louis, St. Louis Area Foodbank, Friends of Kids with Cancer, Great Circle, the Leukemia and Lymphoma Society, and Stray Rescue of Saint Louis. Acura offers a full line of technologically advanced performance luxury vehicles through a network of 272 dealers within the United States. The Acura lineup features seven distinctive models including the RL luxury performance sedan, the TL performance luxury sedan, the TSX Sport Wagon and sedan, the RDX luxury crossover SUV, the MDX luxury sport utility vehicle, ZDX four-door sports coupe, and the all new ILX luxury compact sedan, Acura’s first gas-electric hybrid. Honda and its Acura luxury automobile division are leaders in the development of leading-edge technologies to improve fuel efficiency and reduce CO2 emissions. American Honda, the U.S. parent company, has led the Union of Concerned Scientists (UCS) rankings of overall vehicle environmental performance since 2000. The company leads all automakers with 12 LEED-Certified “Green Buildings” in North America, and is producing products in North America with virtually zero waste to landfill. In 2006, the Honda Motor Company became the first automaker to announce voluntary CO2 emissions reduction targets for its global fleet of automobile, power sports and power equipment products and its global network of manufacturing plants. Today, the company is striving for even greater reductions in CO2 emissions that contribute to global climate change, while also working to minimize waste, water use, and the total environmental footprint of its operations worldwide.